Five AM Sunday: I woke up to a "wet feeling", but wasn't sure if it was my water. So I went back to bed, heart racing like crazy. I tried to sleep, but couldn't until I felt Franklin moving. I dozed off until 8 AM, when I got the same feeling again. This time I checked, no blood again, but it smelled like amniotic fluid. Franklin was still moving, and no contractions. I tried to lay down and go over my options. Being 600+ miles from home, and having to deal with this was quite taxing. At 8:30 I told Kevin that we had a "small problem"! His face sunk. By 9, I went upstairs to tell my parents. (Still no contractions) My dad was joking, asking if I had the baby overnight! Close, but not quite! They got upset, but I remained calm! I'm still not sure exactly how....but I was calm! Now, I know, it was the Peace of God! First ambulance ride.....from Horton, to Westchester Medical Center....a Level 3 Neonatal facility. They again checked me out, and did an ultrasound....Franklin looked great!!! Three + pounds, and healthy! After doing several tests, including a Group Beta Strep, I was admitted to the OB ward at 10 PM Sunday. My room mate was in the same condition as I was, and we were due around the same time! She had been there 14 days when I arrived! Sit and wait! Monday, I spoke with the doctors and told them that I needed to be closer to home, especially if I was going to be staying for the long haul! They agreed! The people there were fantastic! They arranged everything, including a mediflight, on a small plane! By this time, I was stressed and exhausted! I had been "stuck" 6 times for IV's, and each time, they either penetrated the veins, or they "infiltrated" (punctured and the IV ended up under the skin)! I was in pain, needing antibiotics, and my veins weren't cooperating! I had received a steroid shot on Sunday night, then again on Monday night. This was to help speed the development of Franklin's lungs. Oh, I also had another Level 2 US, which showed Franklin weighing in around 3 lb. 6 oz! Everything still looked great!!! I was still calm, and had a peace about the whole experience. Peace that passes all understanding!!! I should have been on a plane on Monday, but my insurance company messed up, and I had to wait another 24 hours. I wasn't a happy camper!!! Tuesday: My "chariot" arrived around 1:30-2 PM, and we were off to the airport! It was an hour and 40 min trip! Not bad, except my IV gave me problems during flight! They tried to stick me again, but she missed, too! Ouch!!! We arrived at Raleigh Durham Airport at 4:40, but had to wait for the ambulance until 5! (They got stuck in traffic!!!!) We arrived at Durham Regional Hospital around 5:30. I was admitted, and checked out. They kept me in the LDR all night for observation. During the flight, I tried to pray. All I can remember saying is "Lord, please keep Franklin safe in your hands". Then, all of a sudden, a "vision" appeared! I saw the Lord's hands, holding Franklin, and he was wearing a diaper, and angel's wings! My eye's popped open, and I could not "connect" in prayer again! I was surprised, and deep down, I think I knew what it meant, but refused to accept it! The OB on call, wanted me to go straight to Duke Hospital (another level 3 neonatal facility), but after being stuck, poked and prodded by strangers, I wanted to see a familiar face! And the head OB in my group said to go to "our" hospital. Well, everything looked fine! So he kept me. Then around 4:30 AM, I woke up shaking with terrible chills! Problems begun! I began to run a fever, and Franklin's heart rate went up to 180-190! It was running 160-165 the whole pregnancy. They rushed me to Duke at 5 AM!!! Fourth ambulance ride! Wednesday, 5:30 AM: I was checked into Duke Hospital's LDR. They checked me out, still not dilated, but Franklin's heart rate was still up, as well as my fever! Decisions! First of all, another IV :'''( They called in a specialist who was wonderful!!! The decision was to induce with Pitocin, and if Franklin went into distress, and emergency c-section would be ordered! Everyone was extremely informative!! I felt at ease! About this time, I was ready for the c-section! I didn't have any energy for a long labor! I was almost begging for one, but I'm glad that I didn't need it! The Pit was started at 7 AM, along with about 4 other bags of fluids! Things went well, and relatively fast! At about 11:30, I was about 4 cm dilated, and by 11:50, I was ready to push! They ran me to the Operating room, "just in case", and with one push, Franklin was born! I got to see him for 2 seconds before they raced him off to the back room to stabilize him. I couldn't see him for another 3 hours, and when I did, I lost it! He was covered with blue sheets, with all these wires and tubes coming out of him. I got to touch him for about a minute, and then was taken to my room. Around 5 PM, the neonatal doctor, Dr. Goldberg, came into talk to me. While he was there, he got page, and raced out of the room. All he said was "it's your son"! I panicked! I called Kevin, who had just left to go home to change clothes and take a shower. He raced back to the hospital, and we were taken down to the NICU. We were there for 2 1/2 + hours, watching everything they were doing to Franklin. Dr. Goldberg kept us informed every step of the way. He was losing hope quickly, and so were we! We kept praying for a miracle. I really felt as if we were going to get our miracle! I didn't expect it to be in the form of an angel! 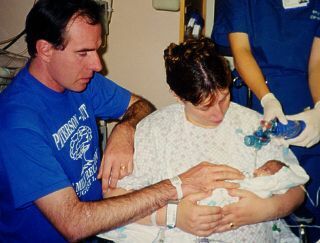 Around 5:40, Kevin felt a "presence" in the NICU. He said it felt like death. He prayed that God would give us a few more hours with Franklin, and then he said it was gone. Around 6:45, they let us hold Franklin while they still kept bagging him with oxygen. They took pictures for us, which we now cherish! Then, we watched his heart rate, which was 180 when we arrived, drop down to 118. We knew what was happening, but it didn't make it any easier!!! They shut off the monitors, and had us turn around while they took off all of the tubes and wires. They wrapped him in a blanket for us, and let us take him to Dr. Goldberg's office, to say our good-byes. Our pastor spent most of the day with us! He was a total blessing!!! He even baptized Franklin, while he was still alive! He said that he saw the light of God, in Franklin's eyes, while he was baptizing him! It really touched him! We could tell afterwards, the impact our son's short life, had on our pastor!! After a while, the Dr. Goldberg came in, and told us that they wanted to bathe Franklin, and give us some memories of his short life with us! The whole neonatal team were fantastic!!! They were almost as upset as we were when he died. They prayed with us, and cried with us! They were our family at that time! Many of the nurses from the LDR, and from the nursery came to off their condolences the morning I was leaving! Most were filled with tears! I came home around 11 AM Thursday morning. It was just too hard listening to the other babies crying all night long! My fever had broke Wednesday night, so they let me leave! They understood! Now comes the healing, both physically and emotionally! This is something (another thing) that we don't wish on any parent! There are so many strings to tie up. Kevin has been wonderful!!! He is taking care of the funeral arrangements. We were going to bury him, but for cost sake, we're going to have him cremated. As my OB said, spend the money on your living children! This has been an extremely emotional week for all of us, and we thank you for every one of your prayers. We're already beginning to heal, but it will take a lot longer to overcome! Another thing that I kept telling Kevin that I was feeling "wiser" the few months before all of this. I couldn't understand it then, it was a great feeling, but now, I think it again, was God's presence, and wisdom! I think He was preparing me for the end! Kevin's "insight" was that one of the neonatal doctors who worked on Franklin, was from Thailand. Kevin's uncle, Andy, fought and was killed in Thailand, trying to save that country. Santi, fought here in the US, to try to save our son! Franklin's middle name is "Andrew"! We named him in memory of Andy! We've never done this with any of our other children!!! The Lord's hand, again?!?!?!? ONE last thing ....While we were driving to pick up our other kids, I was asking Kevin (and God) why didn't He hear our prayers? We had so many people praying for a miracle! Well, out of my own mouth came these words "Your prayers were heard, but sometimes the answer is No!" I broke into tears, because I knew that it was the Lord speaking through my own words!!! Those were the furthest thoughts from my mind! I know our son is in heaven, and will be celebrating Christmas with all of the heavenly hosts, and our family that have gone before us!! What a beautiful sight that must be!!! Franklin's parents shared how GBS changed their lives in a TV segment on WTVD-ABC in Raleigh-Durham, NC.